"His uncertainty made Tessa's heart feel as if it were expanding in her chest, its tenderness big enough to hold them both inside it. She wanted Jem to see her, just as she was, herself, Tessa Gray, with none of the Change on her." I'm still in agony over the ending and I can't believe I have to wait almost two more years (September 2013) to find out how it ends! I'm excited for the Valentine's Day Bloghop. Check out Cassie's blog to find out more!! Thanks for sharing the trailer. I'm really looking forward to the bloghop. It'll be fun to read some hot scenes! I keep reading how awesome this book is and can't wait to get my hands on it. I'm just finishing the first book from the Mortal Instruments series. I'm so behind...UGH! Yay, another book to add :) And thank you for spreading the word! Eep! So super excited! 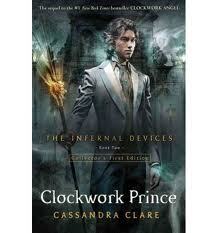 I haven't read it yet, but I've read the Mortal Instruments series and the first one in Infernal Devices - can't wait to pick it up. Like you, I absolutely hate to wait for 2 years for the next one! So would you recommend reading the infernal devices or mortal instruments first?? ps. Im in the middle of reading the Loving Emily book I won on here- loving it!! @Hope, @Emily, and @Cassie--I can't wait for the bloghop either! @Kelley, @Crystal, @Lady Gwen, @Leigh--I'm so excited for you all to read it! @Tanis-I would read The Mortal Instruments first, just because that's how the story technically starts and it's fun to go back to the prequel and recognize a few names. But I do know that Cassandra Clare herself has said it doesn't matter which one you start with. :) And hooray, I'll tell Anne you're loving it!! Hi! Nice to meet you through Cassie Mae's place. I haven't heard of these books - me thinks I've been missing out... I'll be checking them out- thanks! Thanks, Cassie!!!! I'm so excited! Laura, thanks for stopping by, nice to meet you too!! I just BARELY read another blog where the writer was so excited about this book! It must be so good! I can't watch anything on YouTube at work, but that book cover is awesome. Thanks for the rec. I have to say that this book was a little bit of a disappointment. Only because Will seemed like another version of Jace. I liked Jem though. And if I'd read this first and the other series second I'd probably like it more. But I do plan on reading the next one in the series.